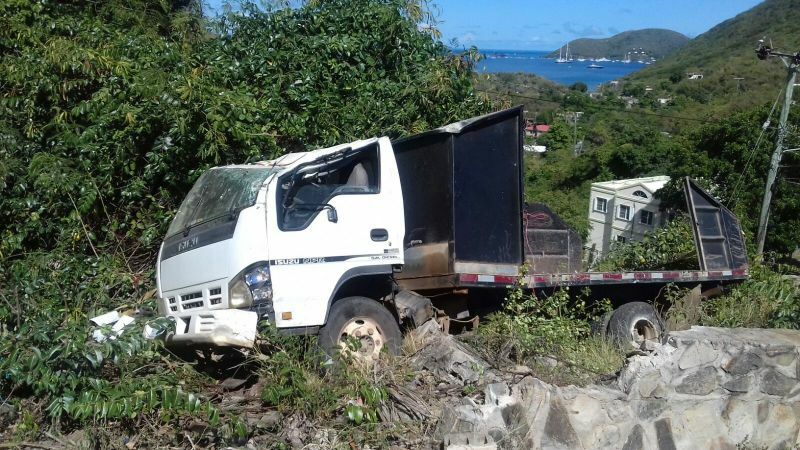 NORTH SOUND, Virgin Gorda, VI- A truck belonging to Arturo George, who owns a construction company on Virgin Gorda, ran off the road today February 13, 2017 at around 2:00 PM while on the North Sound Public Road above the clinic. The immediate area is called Creseda Hill by residents. Mr George was not the driver or a passenger, however, there were two persons in the truck, the driver and a passenger, whose names are unknown. 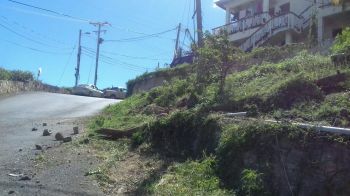 The persons escaped with minor bruises and cuts and were taken to the North Sound Clinic. Police and fire officials were on the scene to investigate the accident where the truck sustained some damages. For years, residents have complained of the erosion of the road and the lack of guard rails in the area where the accident occurred. There is certainly no doubt about the worsening roads on virgin gorda. Those who have voted for this gang on their unsubstantiated belief now reap the consequences of their action. Is this the man who said,he lives on the hill looking down at everyone?If I were you I would calm down son!